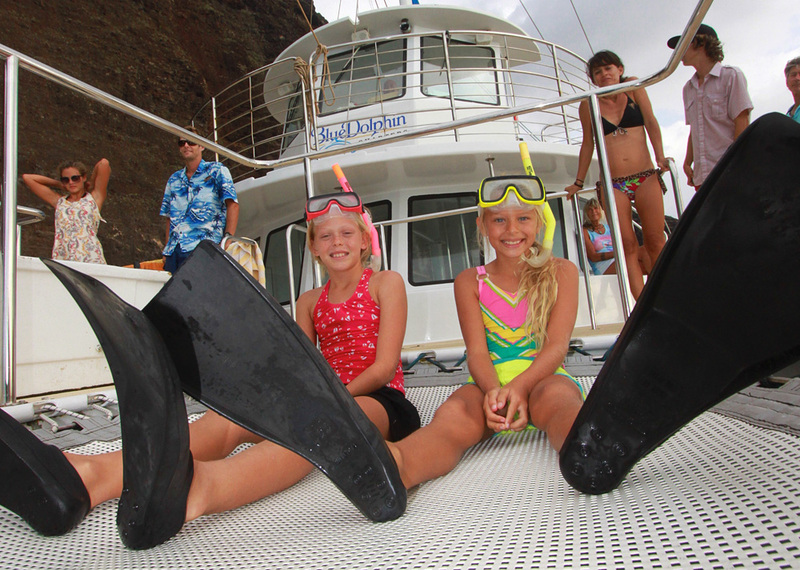 Cruise above and dive below the Na Pali Coast with BLUE DOLPHIN CHARTERS. Everyone in the family will enjoy the timeless beauty in and out of the water. Blue Dolphin Charters provides all the gear you need for snorkeling and even an opportunity for a one-tank scuba dive with or without experience (Scuba age minimum is 12 years old). Noodles and kick boards are available and the waterslide is a blast! The keiki (kids) can learn about the marine environment with their “Fun Facts” trivia game and talk with Blue Dolphin’s captains and crew about the history of Kaua‘i and marine life. Ask about their dolphin guarantee!